Zaman International, an Inkster-based humanitarian organization that provides urgent needs and job skills training for impoverished women with children, will host a Mother’s Day “Destination Hope Brunch” on Sunday, May 6, at Crystal Gardens in Southgate to raise money for its programs. The annual women-only event, which goes from 11 a.m. to 2 p.m., will feature a raffle for more than 90 gift baskets, and a “marketplace” to shop for locally made products. Highlights of the annual brunch are the raffle baskets, filled with kitchen items, spa experiences, home décor, children’s games, and more. Guests can purchase $1 raffle tickets to win baskets valued up to $400 or $5 tickets to win baskets worth more than $400. Guests can also purchase $10 raffle tickets to vie for the grand prize. This year, the event will spotlight Zaman’s BOOST (Building Ongoing Opportunities through Skills Training) program, which provides women with classes in literacy, sewing and the culinary arts, in order to equip them with the skills necessary to enter the job market or start a small business. As part of this focus, WISDOM will be recognized as a key partner that has contributed significantly to the success of this program. Throughout the past two years, WISDOM has served as a recurring sponsor of BOOST’s annual graduation ceremony and provided key in-kind donations to enhance the sewing program. WISDOM’s members even collaborated with BOOST students to create wheelchair caddies for a local physical rehabilitation facility. Tickets for the brunch are $50 per person and can be purchased at zamaninternational.org. All proceeds benefit Zaman’s programs, which include the provision of food, clothing and furniture to high-need families, sewing, literacy and culinary instruction, and dignified infant burial. A rabbi, a priest, a Unitarian Universalist minister, and a Presbyterian pastor all walk into a recording studio. That sounds like a bad start to a bad joke, but it was a wonderful start to a rich conversation. Rabbi Hillel Katzir of Temple Or Hadash in Ft. Collins, CO, invited this group together for a conversation on his weekly radio show on KRFC 88.9, “Faith in Progress.” He wanted us to explore the convergence of Passover with Holy Week and Easter. (Note: You can listen to the entire podcast via iTunes.) Together we discussed how both holidays are celebrations of rebirth. For Jews, Passover represents the rebirth of a people. In the resurrection of Jesus, Christians celebrate the God who brings life out of death and the birth of a new life in Christ. While not all Unitarian Universalists celebrate Passover or Easter, their faith tradition draws from Jewish and Christian themes and earth-centered traditions that recognize the cycle of death and rebirth in the seasons of the year. Throughout the conversation, the Jewish roots of Christianity were emphasized and explored, along with the ways Unitarian Universalism draws from both traditions. Jesus was an observant Jew who certainly celebrated Passover. In the synoptic gospels of the New Testament (Matthew, Mark, and Luke), the Last Supper is depicted as a Passover meal. Some atonement theories utilize the concept of ritual sacrifice found in first-century Jewish practice to explain the effect of Jesus’ death on the cross. Other views of atonement understand Jesus’ death as the ultimate expression of God’s love for the world. The theme of liberation runs through both holidays as well. The Jewish celebration of Israel’s liberation from slavery is paralleled in the Christian affirmation that the resurrection signifies our liberation from sin and death. This thread of liberation surfaces in the Unitarian Universalist commitment to justice and liberation for all people. Rabbi Hillel reflected that Jewish eschatology insists that until all are free, the end will not come. The Christian hope is that the resurrection of Jesus was just the beginning of God’s unfolding plan to free all the world from slavery. These beliefs are reflected in Jewish and Christian commitments to working for social justice. The discussion closed with the recognition that Jews and Christians are called to observe the holidays year after year, remembering again the hope of rebirth, the promise of liberation, and the meaningful connections between our faith traditions. 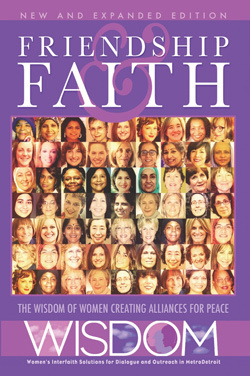 a collection of women’s stories about crossing religious and cultural divides to form friendships. She currently serves as Vice-President of the board of Yucatan Peninsula Missions and on the Committee on Preparation for Ministry for the Presbytery of Plains and Peaks. Amy and her husband, Jason, have a son, Dean. They love hiking in the mountains and biking around town. More than 150 members of the Black and Jewish communities recently gathered at the Charles H. Wright Museum of African American History for the kickoff of the Coalition for Black and Jewish Unity. A new partnership organized by the Council of Baptist Pastors of Detroit and Vicinity and JCRC/AJC, it is dedicated to promoting solidarity between the two communities, while also speaking out against racism and anti-Semitism. Tucked away in Michigan’s Lower Peninsula, somewhere along the winding roads that hug Great Lakes shores, is an idyllic town named Bay View. For more than a century, generations of “Bay Viewers” have congregated here to share in summer activities. What started out as a modest camping ground for Methodist families 140 years ago has quietly developed into a stunning vacation spot for people who can afford the upkeep of a second home. Streets named Moss, Fern and Maple are dotted with impeccably maintained century-old gingerbread cottages. Over the horizon, residents can watch lifelong friends sail their boats across the water. But this paradise is not open to all. In Bay View, only practicing Christians are allowed to buy houses, or even inherit them. Last summer, a dozen current and former resident members filed a federal lawsuit against the town, its ruling Bay View Association and a real estate company, claiming the Christian litmus test was illegal and unconstitutional. Is Bay View a religious community simply seeking to practice its own beliefs, in peace, as it has always desired? Or is it, as the lawsuit claims, a community in clear violation of constitutional, civil and religious rights – to say nothing of federal housing rights? Sophie McGee, an 80-year-old yoga lover with a PhD, proudly shows me around her 1887 Bay View waterfront summer home, which she shared for decades with her late husband. The cottage boasts four fireplaces and has a creaky yet polished quality to it. Over the years, family and friends have filled the home with warmth and laughter. McGee tells me that her father, a Greek Orthodox immigrant, was denied membership at his local golf club, which is how, searching for community and recreation, he started heading north in the summertime to Bay View. Here, he and his family were welcomed as members. That Bay View excludes people based on their religious affiliation – the very behavior that brought McGee’s family here in the first place – is one reason why McGee believes the resort town’s membership policies should be updated, and the opportunity to buy properties opened up to non-Christians. But not all her friends agree, she says. McGee takes me on a tour of Bay View in early autumn, a season that suits it well. One of the few remaining Chautauquas – a name given to late 19th-century Methodist communities who formalized summer camping grounds with arts, education, religious and recreational programs – Bay View’s 447 homes have been deemed so special that they have earned a position on the National Register of Historic Places. The town feels like the place of America’s definitive apple pie recipe – and indeed it very well may be: this is where Irma Rombauer summered, creating and perfecting recipes that eventually led to the publication of the Joy of Cooking, the American culinary bible that sits, well worn, in millions of household kitchens. As McGee and I make our way through the streets, the few, mostly retired residents who are still here after Labor Day shout out warm greetings. A woman accompanied by her pedigree dog vigorously waves at us. It is Betty Stevens, McGee tells me. Betty and her husband, Glenn, a former Bay View Association board member, do not believe the membership rules should change, although Betty is quick to point out that the town gladly accepts non-Christian tenants and visitors, adding that they themselves had a Muslim woman stay with them over the summer. “This place was founded with a purpose. People were coming to a camp meeting ground to participate in a Christian spiritual reawakening,” Glenn Stevens tells me from the porch of his late mother’s house, where Ernest Hemingway once partied. He argues the rules for current members have always been the same, requiring active affiliation with a Christian church. Joining is a voluntary act, he says. To change your mind about these rules once you become a member, as indicated by the lawsuit, is disingenuous. Jon Butler, a historian of religion and a professor emeritus at Yale University, says the existence of these rules is not entirely abnormal; many Americans still live in homes that have restrictive covenants inscribed into their deeds. They are just not usually enforced. What is surprising, he says, is “that the association being sued is defending itself”. Can there be a religious exemption to discrimination? Early Bay View documents dating up until the beginning of the 20th century show that although the resort community has always had a Christian mission, the original membership requirements were being over 21 and of “good moral character”. The Christian exclusionary component was introduced in the 1940s. This was a time of heightened racial anxiety and antisemitism in the US, with swaths of Jewish refugees denied asylum from Europe – an act supported by a majority of the American public. The Christian-only clause was introduced together with a white-only clause, which the association eliminated the following decade. Catholics were given a 10% quota, which was eventually dropped. Over the years, however, the Christian-only requirement was, if anything, reinforced. The lawsuit charges that Bay View Association, although private (some private entities including gentlemen’s clubs or the Boy Scouts, for example, historically have been able to discriminate), acts in effect as a governmental entity, endowed with the powers to police and enforce laws. As such, the lawsuit claims, it is engaging in religious discrimination in violation of the US and Michigan constitutions, Michigan’s civil rights act and the Fair Housing Act. Mike Steinberg, the legal director of the American Civil Liberties Union of Michigan, believes the lawsuit is an “open-and-shut case”. “This is pure discrimination by a governmental entity. Bay View is clearly one and governmental entities cannot favor one religion over another, or religion over no religion.” The federal lawsuit is only in its first steps, though, having failed in mediation at the end of January. And under the Trump presidency, with a rightwing-dominated supreme court sympathetic to religious arguments, times feel uncertain. He can’t will his property to his Jewish wife. This very question has become a painful issue for Jeremy Sheaffer, a fifth-generation Bay Viewer. Sheaffer, 50, spent his summers in Bay View. He forged lifelong friendships here and has always considered it the place where he had roots, particularly as his family moved a lot when he was growing up. But the environmental NGO worker says his relationship with the place he calls “home base” has reached a crisis point. “I have no way to legally will my cottage to my wife or my children,” says Sheaffer of his summer home. Sheaffer, who defines himself as culturally Christian, is married to a Jewish woman who cannot inherit his home because of her religion. Under the existing rules, their two children, aged 11 and 14, themselves sixth-generation Bay Viewers, would also be barred from inheriting their father’s property because of their mixed religious makeup. Undeniably, religious self-segregation is at the core of the everyday practice of many faiths. The wish to assemble with like-minded religious folk, maintain tradition and provide a steady Christian perspective in a changing world appears to be at the heart of the arguments levied by Bay View residents who believe the rules should stay intact. The first amendment prohibits the establishment of a religion by government, but within the same paragraph also provides for the right of people to freely assemble. This could appear confusing in this case. But Bay View is not simply a Christian club, or a church. While the governing Bay View association enjoys 501(C)(3), or charity, status through an affiliation with the Methodist church, the homes on its land are sold at a profit by individuals on the marketplace. Four percent of all Bay View home sales are directed to association coffers, and current properties are listed between $120,000 and $1m. In the first half of the 20th century, racially and religiously restrictive covenants (which restricted home sales to specific groups) were created not just to maintain cultural hegemony in predominantly white, Protestant American neighborhoods, but also to protect the financial value of houses. This was based on the government-backed, racist idea that the influx of non-whites would bring property value down. Racially restrictive covenants were ruled unenforceable by the supreme court in 1948, almost exactly 70 years ago, kicking off an era of civil rights legal change. Historically, religious exclusion has repeatedly gone hand-in-hand with racial exclusion in the US. It is difficult to know what the exact motivations of voting board members were in the 1940s when the Christian requirement was first introduced. What was first uncovered through archival research by the then Bay View member David Krause is that through a series of calculated tweaks in bylaws between 1942 and 1947, the board, led by a lawyer from Indiana, seemingly violated its own articles of association and introduced new membership requirements, stipulating that members should be “of the white race and the Christian persuasion”. Matt Pehl, a professor of history at Augustana University, says he is not surprised to hear about the introduction of such policies in Bay View during this time. Racist as well as anti-Jewish and anti-Catholic viewpoints were espoused openly by respected members of the community throughout the midwest, he says. Indiana as well as Michigan were hotbeds for the Ku Klux Klan starting in the 1920s, he says, and Henry Ford, the great local industrialist, was a renowned antisemite. “The Klan at this point would talk about ‘the threat on white civilization’. What’s important in that phrase is not just the white part, it’s the civilization part. What they mean by threat on civilization is a threat on Protestant civilization,” Pehl says. Jernegan’s community, Mishawaka, was home to a Ku Klux Klan chapter starting in 1927. At the very least, this means that Jernegan lived ina cultural context where, as Pehl puts it, KKK beliefs and concerns were “widely shared and strongly endorsed”. As some members in the 1940s were fighting to make Bay View more closed, others were putting time and effort into helping Jewish Europeans escape and emigrate to the US. But as he’s grown older, he says, it’s become harder to digest the exclusion of non-Christians by the community. As a biracial kid, Sheaffer was one of the very few non-white children to attend Bay View’s campus every year. Well aware that up until the late 1950s he wouldn’t have been allowed to stay there, Sheaffer says even if they got rid of the white-only policy a while ago, it is no coincidence the community has remained almost entirely white. Tisa Wenger, a professor of American religious history at Yale University, explains that it is difficult to tease out the religious and racial components of this case. She says much of the mid-century history of Bay View matches national trends, with racial segregation ending and white people doubling down on religious restrictions and creating private organizations in which they could control membership intake. “They don’t have to be Trump voters to be wanting to protect a certain enclave. A lot of white Americans are deliberately blind to this,” she says. B’nai Brith Canada is appalled after learning Wednesday morning, March 21, 2018 that a synagogue in Thornhill, Ont. has been targeted by antisemitic vandalism. On Wednesday at about 9:40 a.m., a vandal smashed the glass doors of Chabad at Flamingo with a rock, according to Chabad Rabbi Mendel Kaplan. York Regional Police have been contacted and are on the scene. Downtown Synagogue shared its pre-seder with community partners. ear when they learned the Tigers Opening Day landed on the same day as the synagogue’s traditional second-night community seder. The popular game meant impossible parking and difficulty getting to the synagogue, a few blocks from Comerica Park. The powerful Passover story is about leaving oppression and going to a place of freedom, she says. “We’re taking parts of the haggadah and looking at it through an interfaith lens. We’ll talk about how we were slaves and became free. But what do slavery and freedom mean to our African-American partners” still struggling for freeddom. At press time, the synagogue has reached capacity for the community seder. Officials at the memorials, German Jewish groups, historians and other intellectuals have debated the issue, with responses ranging from an enthusiastic embrace of perceived allies against racism to outrage over efforts seen as a whitewashing and denial of history. Bhakti Marga, whose name means “path of devotion” after an ancient Hindu devotional rite it practices, held a chanting session this month in the memorial at Buchenwald, with support from the administration of the camp memorial and the local Jewish community. Last year, it held similar om chantings at the memorial in Mauthausen, the largest concentration camp in Austria, and Terezin (Theresienstadt) in the Czech Republic, which Nazi propaganda used to portray as a model wartime internment camp. Bhakti Marga, which has its main ashram in the countryside near the western German city of Wiesbaden, says its followers held chantings at negatively energized sites in Austria, Croatia, Slovakia, Czech Republic, Germany, Poland, Japan, Belgium and the United States on Feb. 24. Its main ashram could not give details. Founded in 2005, the group says it has followers in 52 countries and 30 temples in 19 of them and argues that its chantings are purely religious. “Om Chanting is a free group practice that uses the transformational power of Om to activate the self-healing potential of participants,” it explains on its website. The chanting, which can be heard on SoundCloud, “generates a vibrational frequency that releases negativity, transforms it and showers participants with positive energy. The vibrational waves created by the circle spread out in a 2-kilometre radius, creating a harmonious, peaceful environment and a unity between humans and nature.” The negative vibrations at these Nazi sites are palpable, the group claims. Administrators at concentration camp memorials routinely grant requests from Christian and Jewish groups to pray on their premises, but Bhakti Marga has confronted them with a very different religious tradition. “We’re used to Protestant, Catholic and Jewish groups. We’re not used to Hindu groups but we see no reason to ban the Hindus from doing this,” Rikola-Gunnar Lüttgenau, spokesman for the Buchenwald memorial, told the local television station MDR during the rite there on March 17. “We have investigated to see if the history of the place is being negated. That is not the case. We’ve looked to see if they take this place seriously. That is the case,” he said. “They take a tour, they watch a film, there is a conversation with the local Jewish community. So we approved it as a normal event, like those from groups of other faiths.” Reinhard Schramm, head of the Jewish community in Thuringia state, had no problem meeting the Hindus. But asked whether chanting could purify the site, he said: “If it were that simple, I’d join them.” The memorial at Flossenbürg in northern Bavaria – the camp where the Lutheran theologian Dietrich Bonhoeffer and Adm. Wilhelm Canaris were executed in April 1945 for plotting to kill Hitler – turned down a Bhakti Marga request to chant there last month. The Antisemitism Research and Information Center in Berlin also had its reservations about the rite. “The chantings do not deal with the specific history of these places,” its spokesman Alexander Rasumny told the daily Die Welt, noting the list of places the group wants to “purify” ranges from concentration camp memorials to sites where American Indians were massacred. “This is a mixture of different events that aims to relativize the Holocaust.” Heike Beck, a minister for interfaith relations in the Protestant church district where the Bhakti Marga ashram is located, said the fact the group always used the same ritual at sites marked by different kinds of tragedies did not seem right to her. April 4, 1968, is a day written into history. It was then that an assassin fatally shot Dr. Martin Luther King Jr. in Memphis, where he had been supporting striking sanitation workers. The preacher and civil rights icon has become synonymous with social justice. So to mark the 50th anniversary of his slaying Wednesday, Metro Detroit interfaith officials and activists hosted an event placing King’s life, views and impact at center stage. And to them, the ultimate goal was not only to recall the historic figure’s work in pushing change but extending those efforts in 2018. “The dream is not only a dream but a dream of action,” said Donnell White, executive director of the Detroit Branch NAACP. Balancing memorializing King while calling for justice anchored the evening gathering at Detroit’s Greater New Mt. Moriah Missionary Baptist Church. Presented by the church and the InterFaith Leadership Council of Metropolitan Detroit as well as coinciding with other observances across the country, the program drew Christian, Jewish, Muslim and Sikh followers to highlight King’s role in the national push toward civil rights. Many reminded the diverse crowd seated in the pews that a half-century after his slaying, King’s quotes, stances and mission remain a clarion call for activists. Others recognized that though King, whose final speech was broadcast during the ceremony, often is remembered for working to improve race relations, his final years revolved around human rights. Imam Mohammad Elahi spoke on April 3, 2018, in his Dearborn Heights mosque, Islamic House of Wisdom, against the so-called Punish a Muslim Day fliers that called for violence against Muslims on April 3. Elahi was joined by Religious leaders, Dearborn Police Chief Ron Haddad and a Republican leader and they gathered in a Dearborn Heights mosque to condemn flyers that call for violence against Muslims. At the Islamic House of Wisdom, they spoke out against so-called “Punish A Muslim Day,” which was promoted by flyers initially mailed in the U.K., according to British media reports. The flyers, which award points to people for various types of violent action against Muslims, then spread by social media to other places, including in metro Detroit, scaring Muslims. Dearborn Police Chief said they’re not responding to anything locally since there haven’t been any reported threats of actions. Haddad urged people to call 911 if they see or face any threats, saying that police are “prepared as a community to ensure the safety of everyone.” Ron Dwyer, 11th Congressional District Republican Committeeman, attended the interfaith gathering, condemning anti-Muslim bigotry and other types of racism. “We must protect our kids, that they don’t live in fear,” Huskic said. Elahi and others also mentioned the 50th anniversary on Wednesday of Dr. Martin Luther King Jr.’s assassination, linking his message to their message against Islamophobia. The Rev. Ed Rowe of Detroit spoke of the message of King, saying that it’s important for people to stand in solidarity with groups outside their own. “Those great messengers, they stood against hate,” Elahi said. The story of exodus that was told over the course of the night was not of Moses and the ancient Jews’ sojourn eastward across the Red Sea, but of a man named Mohammed Al Samawi, who escaped a near-certain death in his home country, Yemen, by traveling westward over the Red Sea on what happened to be the second night of Passover in 2015. “Unleavened,” as this night was billed, was organized by Adam Kantor, an actor appearing in “The Band’s Visit“; Benj Pasek, the lyricist of “La La Land,” “Dear Evan Hansen” and “The Greatest Showman”; and four other friends, all of whom are interested in contemporizing Judaism and making it relevant in an increasingly secularized climate. “The idea is to look at the Passover story about the passage from slavery to freedom and to contextualize it for 2018,” Mr. Kantor said. The cost of the interior design, lighting and dinner was underwritten in part by Reboot, a cultural organization for young Jewish adults who work in creative professions that encourages its members to rethink and express religious identity. As guests (of many ethnicities and faiths) arrived, they found small round tables, like tree stumps in a pillow forest, on which small dishes of olives, horseradish and parsley were set by stacks of matzo. Around the periphery of the room, jazz singers, piano players and Broadway performers were stationed, ready. But for what? “I’m not sure what I’m supposed to do here,” said Katie Couric, when she walked into the room, red wine imported from the Galilee region of Israel in a plastic cup in her hand. Ronan Farrow, a reporter for The New Yorker, was equally perplexed. “I feel like this is an Agatha Christie novel we’ve all walked into and someone is not going to be able to leave,” he said. The guests settled onto their pillows, and Cécile McLorin Salvant, whose “Dreams and Daggers” won the 2018 Grammy for best vocal jazz album, soon brought chatter to a halt with her rendition of “Go Down Moses,” sung a cappella. This one may have been the best programmed. After settling in many months ago on Mr. Al Samawi’s story as “the clothing line” that would extend throughout the night, Mr. Kantor said before the Seder began, “we have been talking about what we can drape from it.” One performance was by Daniel J. Watts, an actor and writer who appeared on Broadway in “Hamilton.” He said he was asked by the organizers to create a piece about the concept of enemies. He wrote his poem, “Inimicus,” the morning of the Seder. When it was his turn, he stood with a microphone in his hand and spoke while turning himself slowly in full revolution. His audience was mesmerized. They were also captivated by Rachel Bay Jones, who won a 2017 Tony for her role as Heidi Hansen in “Dear Evan Hansen” and Caissie Levy, who plays Elsa in the new Broadway production of “Frozen,” singing “Over the Rainbow” in two parts, sandwiching a reading from NPR’s Ari Shapiro about the song’s history and context. For the final performance, the singer and songwriter Shaina Taub sat at a piano and sang her forthcoming song “Huddled Masses,” which was inspired by a protest poster that quoted from Emma Lazarus’s poem “The New Colossus,” which she noticed at Kennedy Airport after President Trump first proposed restrictions upon travelers from certain countries, including Yemen. “That was very powerful, and very special,” said Jeffrey Richards, a producer who has helped stage plays including the 2015 revival of “Fiddler on the Roof,” in which Mr. Kantor played the role of Motel the tailor. Each of the Seder performances connected to Mr. Al Samawi’s story, which was told by him and Daniel Pincus, 39, a Jewish businessman and philanthropist who helped him escape Yemen, and whose apartment was the setting for the dinner. By 9:30, a kosher dinner of Persian jeweled rice and pomegranate and walnut stew was served, prepared by Behzad Jamshidi, a child of Iranian refugees. A microphone was passed around for impromptu interpretations of “Moses Song,” guests congratulated performers and snapped selfies, and Mr. Al Samawi tried to take it all in. “I was hiding in a small bathroom waiting to be killed and now I’m here,” he said.